Whether you're recording a live performance, a podcast, a class or workshop, a rehearsal, a song writing session or even a sizzling performance of your band, the H4 has all the tools available. Weighing just 190g, the H4 puts a remarkable amount of recording power in the palm of your hand. To underline its accent on music recording applications it has built-in studio effects such as compression, limiting and mic modelling. Its combination of XLR + 1/4-inch Jack inputs enable external mics, guitars, bass or keyboards to be connected. 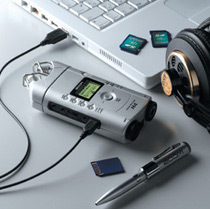 Audio can be recorded as WAV or MP3 files and moved to a computer via USB for easy editing, mixing and mastering. 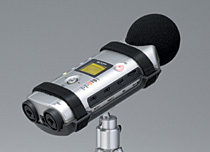 Stereo recording is often accomplished by using two microphones in a V-shaped set up that faces the performer. While this method will result in good stereo separation, responsiveness for the area directly in front of the mics will be low, causing problems with depth perception and imaging. 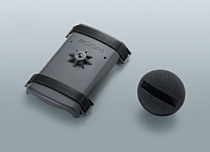 The Zoom H4 uses an X/Y configuration where the two microphones point inward at a crossing angle. This allows the recorder to cover a wide area, and at the same time capture sound sources in the centre with perfect clarity and definition. Phase differences between left and right channels are also eliminated because sound is picked up simultaneously by both microphones. The H4 allows up to 24-bit/96 kHz linear PCM recording in WAV format, resulting in excellent transparency and definition that exceeds the sound quality of CDs. This is great for capturing the nuances of an acoustic instrument while preserving the ambience of the recording location. Or you can record directly as MP3 files for longer recordings that still provide acceptable sound quality. The H4 records onto Secure Digital (SD) Media cards. These boast an amazing amount of recording time in a small package. And unlike tape or disc media, mechanical vibrations do not affect recording quality. With an approved 2GB SD memory card, the H4 can provide up to 190 minutes of stereo WAV file recording in 44.1 kHz/16-bit mode or as many as 34 hours when recording at 128 kbps in MP3 stereo mode. The H4's two phantom powered combo XLR + 1/4" input jacks enable you to connect our recommended range of professional external microphones (below) to work well in many recording situations. You can also use the H4's high impedance (Hi-Z) rated jack inputs for direct connection of guitars, bass, or any other line-input device. The H4's dynamic range allows you consistently to match the input level with the source. Whether you're recording a band's live performance, a solo vocalist, acoustic instruments, a classroom lecture or even a subtle soundscape, the H4's automatic gain control lets you limit peaks to -6 dB during Rec Stand-by mode. And its built-in level meter and separate Low / Mid / High gain settings for the built-in stereo mics mean you can monitor operation and make adjustments on the fly. Capture vocals, guitars, bass, keyboards, drum machines and other instruments on separate tracks with the H4's 4-track mode. 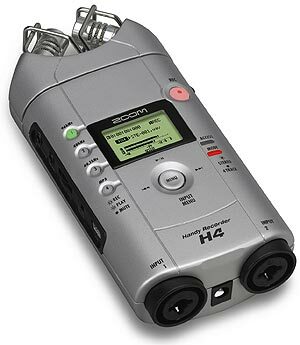 The H4 allows simultaneous recording on two tracks and simultaneous playback on four tracks. Level and panning can be adjusted for each track individually. Punch-in recording and track bouncing make editing a breeze. Other features include a versatile tuner for guitar and bass, a metronome for use as a rhythm guide and A/B repeat capability. NB : While in 4-track mode, the H4 records as 16-bit/44.1kHz WAV files. The integrated DSP effects processor with 32-bit architecture employs the latest modelling technology to replicate the most famous guitar, bass and microphone sounds. The array consists of 4 microphones (SM57 / MD421 / U87 / C414), 12 guitar amps and stomp boxes such as Fender, Marshall, Vox and Mesa Boogie; and 6 bass amps and preamps including Ampeg, Bassman and Hartke. We've also included a compressor / limiter to prevent input signal overload; Zoom Noise Reduction (ZNR), and other effects such as chorus, flanger, phaser, delay, and reverb. 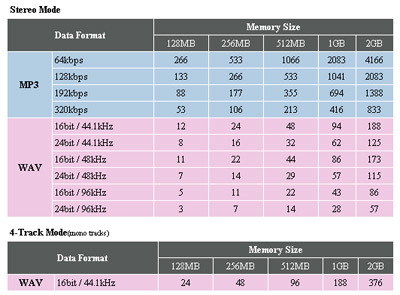 The effects memory of the H4 accommodates 60 patches. 50 presets are already programmed for applications such as direct recording of guitar and bass as well as mic recording of vocals and acoustic guitar. NB : In stereo mode, only mic modelling and the compressor/limiter effects can be used. 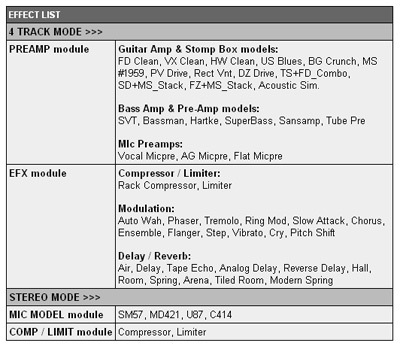 Mic modelling effects are only for use with the built-in microphones. The H4 also will also function as a direct audio interface for your PC. Connect the supplied USB cable and record directly to your computer. 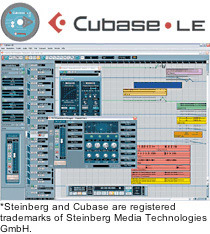 The H4 comes bundled with Cubase LE from Steinberg so you can start to produce and edit music on your PC, via the H4, straight away. Thanks to the direct hardware monitoring function, there is no latency problem, you can hear what you're recording as you're playing it. NB : Effects can only be used when the sampling rate is 44.1kHz. When the H4 is connected to a computer via USB, like all solid state recorders it also functions as a card reader. This allows you to drag and drop audio files to your computer like you would pictures from a digital camera. Create a media player sound library, tailor a recording with a waveform editor, then mix and master with a DAW. Then create your own CDs, send files by e-mail, or use them for podcasting. The H4 will also function as a portable MP3 player. The H4's easy-to-use control interface uses cursor keys and a jog dial that lets you operate most functions with one hand. Its backlight LCD makes for easy navigation, even in dark settings, thanks to a clear graphic layout and well-designed icons. A key-hold function prevents inadvertent operation during recording. Thanks to its circuit design optimized for low voltage operation, the H4 can record continuously for about four hours on a pair of AA batteries. The supplied AC adaptor (AD-0006) can be plugged in for extended use. 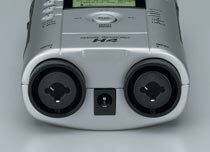 When using the H4 as an SD card reader or USB audio interface, it is powered from the host computer.